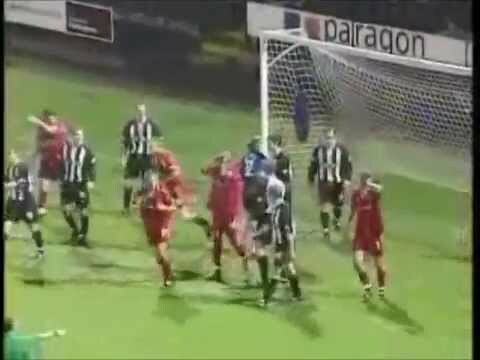 Club history/stats - Up The Maggies! 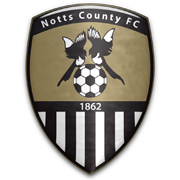 The oldest professional football club in the world, Notts County were nearly fifty years old by the time of their first game against the Town, in the First Round of the FA Cup in 1911. 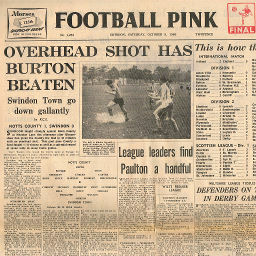 Two goals from Archie Bown and one from Harold Fleming gave Southern League Swindon a 3-1 win over their First Division visitors, and they repeated the victory in the Second Round the following season, this time winning 2-0 on their way to a Cup semi-final appearance. 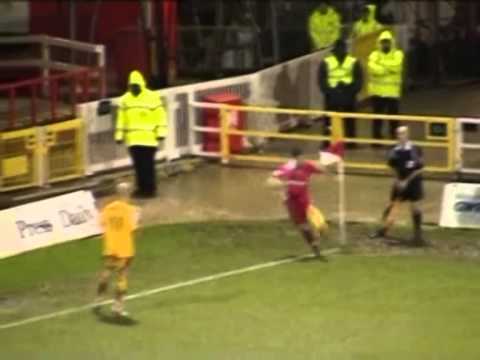 The Town's biggest victory to date against County came in March 2003 - Sam Parkin scoring a hat-trick in a 5-0 win. 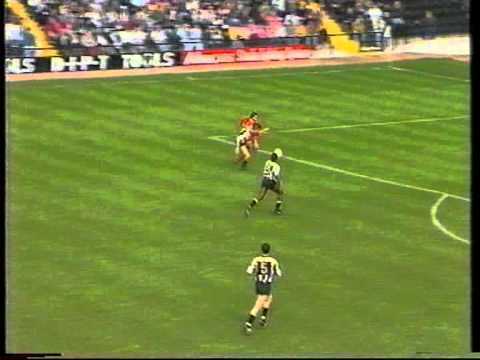 The following August, Swindon notched a 4-0 win against the Magpies, a game marked by an emotional pre-match speech by Jenny Davis, mother of ex-Town loan player Jimmy, who was tragically killed in a car crash just weeks earlier. Former Town keeper Steve Mildenhall played for County in both games. 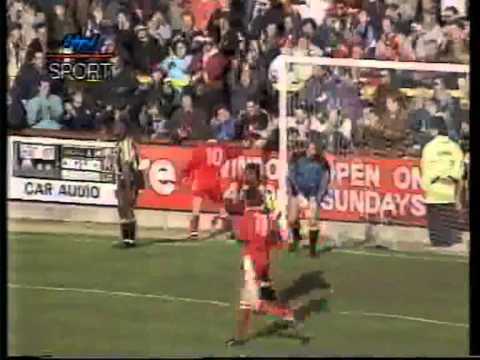 Struggling at the bottom of the table, Swindon go two down against high flying Notts County - and though Dean Yates is sent off for the away side, the Town can only pull one goal back. 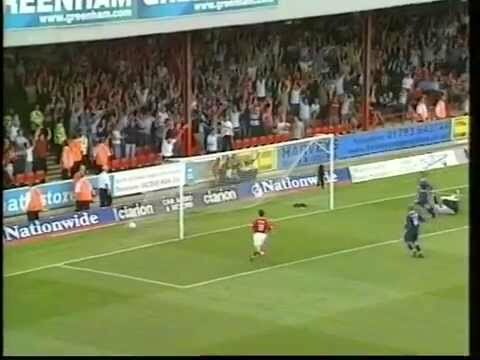 Kevin Horlock scores on his full league debut - netting the Town's fourth in a comprehensive 5-1 victory over the Magpies. 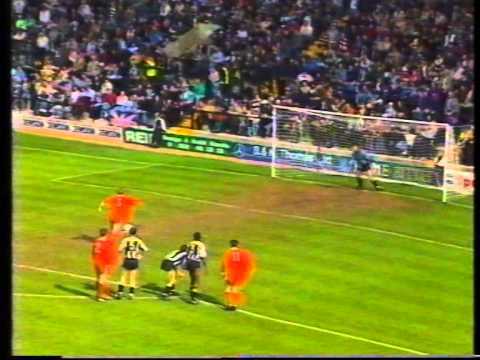 After Notts take an early lead, a professional foul on David Mitchell sees Richard Walker sent off - Paul Bodin dispatches the resulting penalty and the game ends in a draw. The Town win at Meadow Lane, despite Joey Beauchamp's sending off. 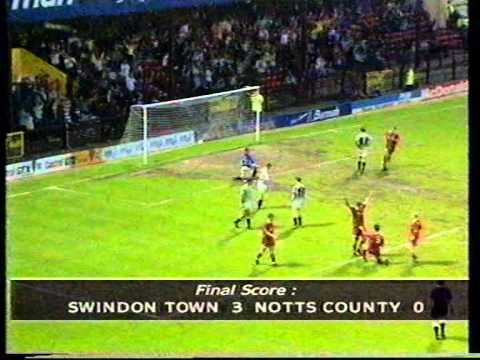 It's too little, too late for already relegated Swindon - having drawn a blank in the last three games, they suddenly find their scoring boots against Notts County. 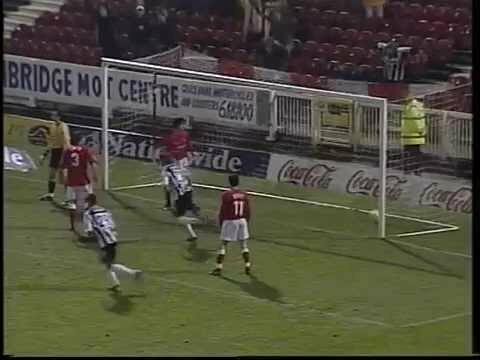 Backed by a persistently noisy travelling support (my hands were white from clapping to the tune of "Steve McMahon's Barmy Army" by the end of the game), two goals from Shaun Taylor and a Paul Bodin strike give the Town victory at Meadow Lane. Kevin Horlock's 89th minute winner sends the Town back to the top of the table, still with their three games in hand over second placed Blackpool. 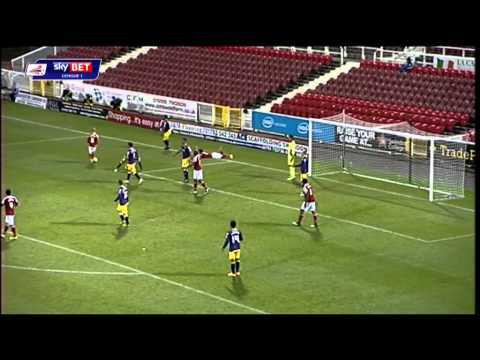 Two Danny Invincibile goals are in vain, as managerless Swindon go down at Notts County. 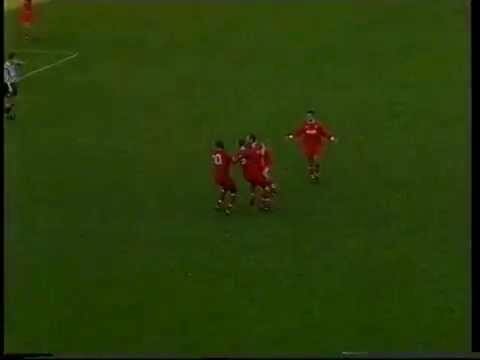 After Roy Evans resigns as the Town supremo, with the club rumoured to be �3. Danny Invincibile's solo effort proves to be the difference between the sides. 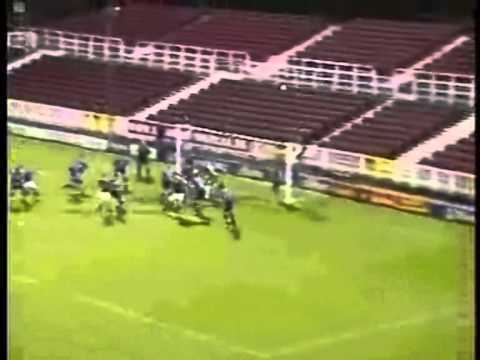 Sam Parkin gives Swindon the lead after they put on a lot of pressure - but Notts equalise in the second half. Sam Parkin nets a hat-trick, as Swindon stick five past hapless former Town keeper Steve Mildenhall. 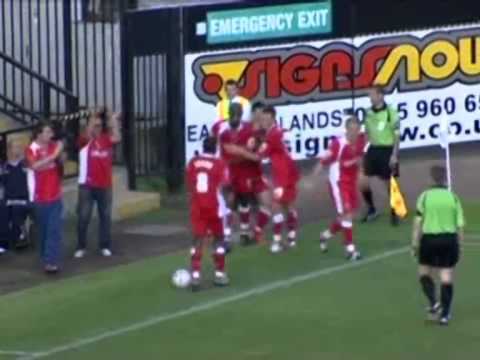 On an emotional afternoon after the recent death of former loanee Jimmy Davis, whose mother delivers a heartfelt speech before kick-off, the Town End declare that Swindon are going to "win it for Jimmy" - and the team don't disappoint, winning 4-0 - the only blot on the copy book being a red card for Sammy Igoe. Tommy Mooney's late goal gives the Town a win at Meadow Lane. 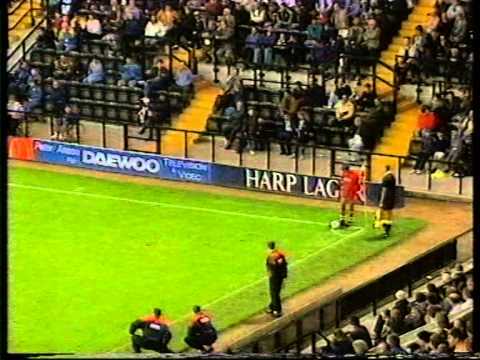 Stefan Oakes' stoppage time goal for Notts County takes the cup tie to a replay. With a home tie against Middlesbrough the prize for the winner, Swindon give an atrocious performance at Notts County, and are turned over 2-0 in front of the Sky cameras. 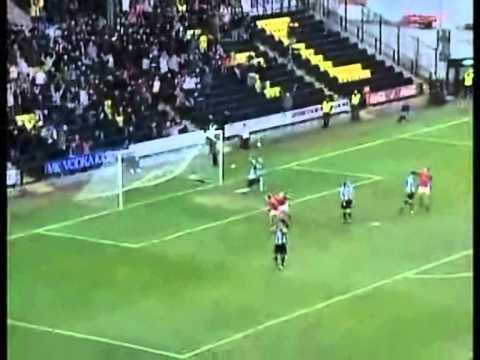 Fola Onibuje's first goal is not enough to win the game at Meadow Lane. I treat my six year old daughter to her first County Ground experience - a 1-1 draw on a damp, soggy late December afternoon. 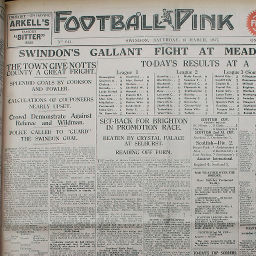 Click to view a newspaper report of Swindon's 1-2 defeat against Notts County in the 1930-1931 season. 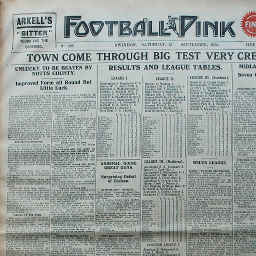 Click to view a newspaper report of Swindon's 0-2 defeat at Notts County in the 1930-1931 season. 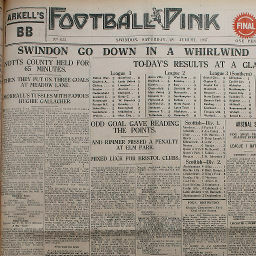 Click to view a newspaper report of Swindon's 2-1 win against Notts County in the 1935-1936 season. 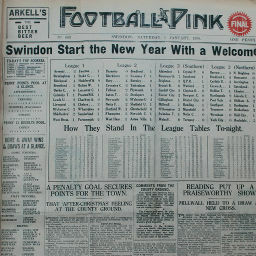 Click to view a newspaper report of Swindon's 0-0 draw at Notts County in the 1935-1936 season. 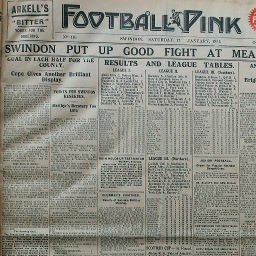 Click to view a newspaper report of Swindon's 2-2 draw against Notts County in the 1936-1937 season. 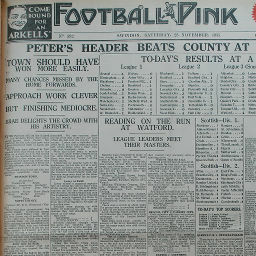 Click to view a newspaper report of Swindon's 2-3 defeat at Notts County in the 1936-1937 season. 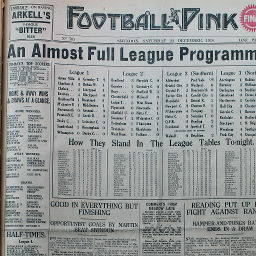 Click to view a newspaper report of Swindon's 0-3 defeat at Notts County in the 1937-1938 season. 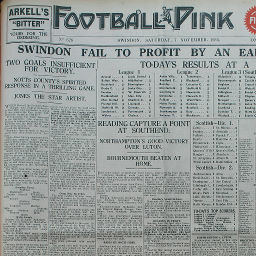 Click to view a newspaper report of Swindon's 1-0 win against Notts County in the 1937-1938 season. 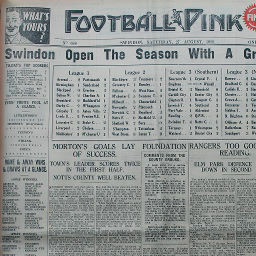 Click to view a newspaper report of Swindon's 4-1 win against Notts County in the 1938-1939 season. 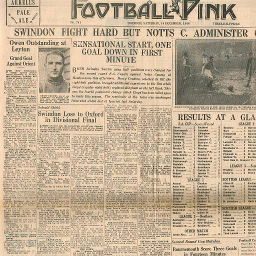 Click to view a newspaper report of Swindon's 0-2 defeat at Notts County in the 1938-1939 season. 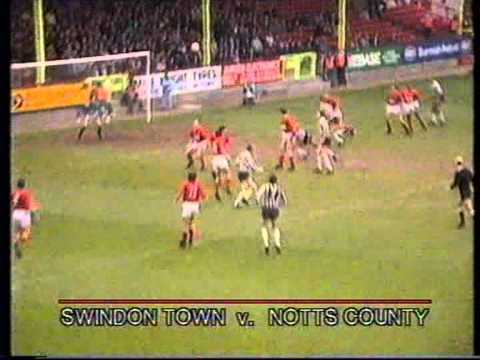 Saturday, December 14, 1946 SWINDON FIGHT HARD BUT NOTTS C. ADMINISTER CUP K.O. 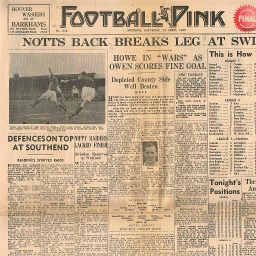 Click to view a newspaper report of Swindon's 1-2 defeat at Notts County in the 1946-1947 season. 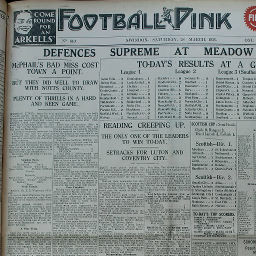 Click to view a newspaper report of Swindon's 1-1 draw against Notts County in the 1947-1948 season. 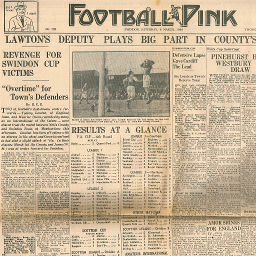 Click to view a newspaper report of Swindon's 1-0 win against Notts County in the 1947-1948 season. 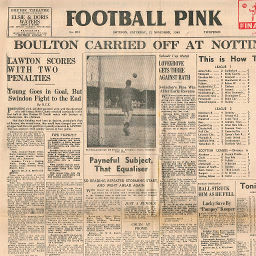 Click to view a newspaper report of Swindon's 1-2 defeat at Notts County in the 1947-1948 season. 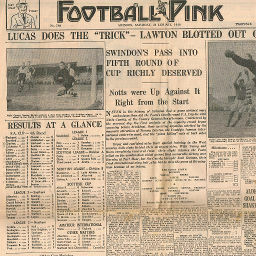 Click to view a newspaper report of Swindon's 3-0 win against Notts County in the 1948-1949 season. 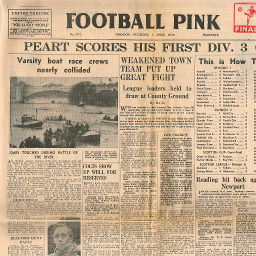 Click to view a newspaper report of Swindon's 0-3 defeat at Notts County in the 1949-1950 season. 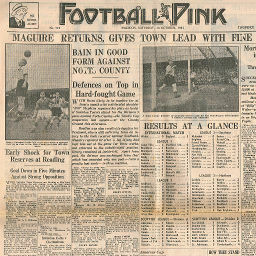 Click to view a newspaper report of Swindon's 1-1 draw against Notts County in the 1949-1950 season. 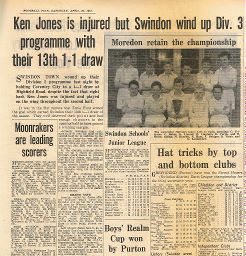 Click to view a newspaper report of Swindon's 3-1 win against Notts County in the 1958-1959 season. 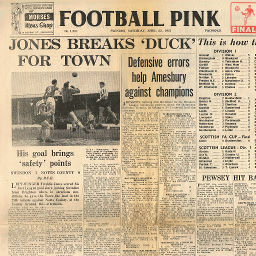 Click to view a newspaper report of Swindon's 0-1 defeat at Notts County in the 1958-1959 season. 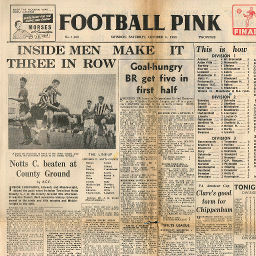 Click to view a newspaper report of Swindon's 0-1 defeat at Notts County in the 1960-1961 season. 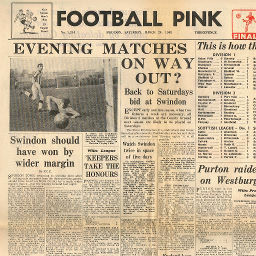 Click to view a newspaper report of Swindon's 1-0 win against Notts County in the 1960-1961 season. 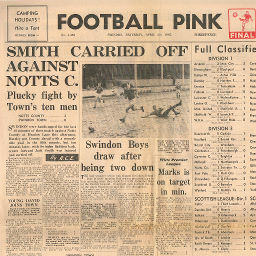 Click to view a newspaper report of Swindon's 1-0 win against Notts County in the 1961-1962 season. 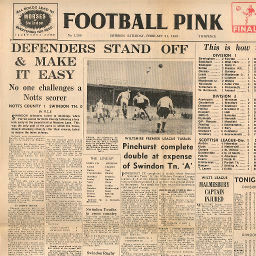 Click to view a newspaper report of Swindon's 3-1 win against Notts County in the 1962-1963 season. 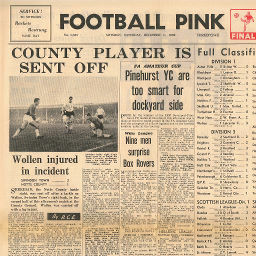 Saturday, April 20, 1963 SMITH CARRIED OFF AGAINST NOTTS C.
Click to view a newspaper report of Swindon's 0-2 defeat at Notts County in the 1962-1963 season. 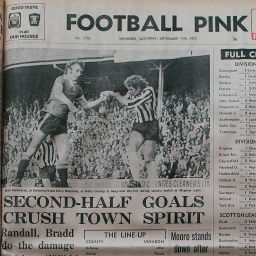 Click to view a newspaper report of Swindon's 0-2 defeat at Notts County in the 1973-1974 season.